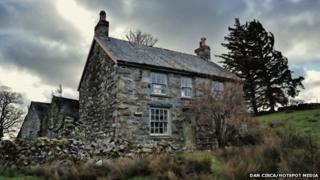 A forgotten farmhouse in mid Wales, left untouched for years, has been captured on camera. Dubbed the 'Cloud House', due to the cloud topped mountains that surround it, is in a remote location which has no accessible road. Inside the house are trinkets and artefacts, including pocket watches and photos, all from decades ago. Photographer Dan Circa said he had a feeling visitors "were welcome, as long as they behave themselves".